Yes, we have finally been matched. With all adoptions, we must leave our hands open before the Lord. Matched adoptions can change- but we hope to bring home our sweet bundle in just one month! So – we have one month to clean our home, our hearts, and raise the money we need to make our adoption possible. With that in mind, I want to share with you an amazing bundle deal. I am excited to have TWO books in this bundle- and I can tell you that some of my favorite authors are in this pack to. Read more below on how you can get one of these amazing bundles! Most of us do a little spring cleaning in our homes, but have you considered that sometimes our hearts could also use a little freshening up? Just like a breath of fresh air, this bundle will help infuse life directly into your heart and home. 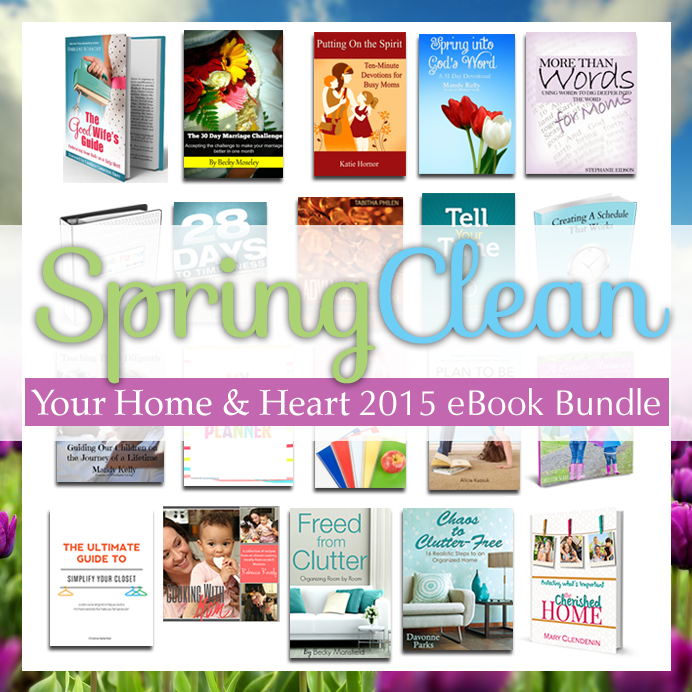 Valued at $138, we’re offering this Spring Clean eBundle to you for only $14.74! That’s an 89% discount! 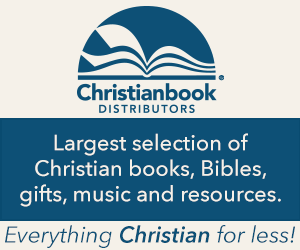 And at just $0.73 per book, it’s a deal you won’t want to miss. From video courses to organization guides to fun printables, this bundle is sure to have you feeling motivated and inspired as you spring clean. As someone whose own home has gone from chaotic to clutter-free, the author understands how difficult, discouraging, and energy-zapping clutter can be. But she also knows this: no matter how disorganized your home currently feels, there is hope. Chaos to Clutter-Free reveals the hope so you can make positive, lasting changes in your own home, starting today. 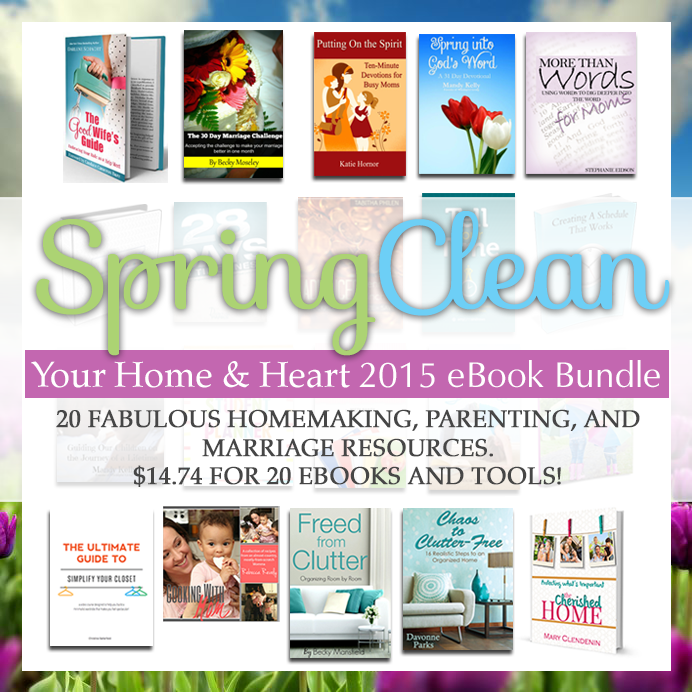 Freed from Clutter is a wonderful resource for you! It will take you from decluttering your home to organizing it. Clutter can cause emotional stress, so becoming free from clutter will bring an overall peace to your home. Can’t find anything to wear even though you have wall-to-wall clothes in your closet? Then you need a closet overhaul! Simplify Your Closet is a 9-session video course designed to help you PLAN your ideal wardrobe, STREAMLINE your current closet, and CREATE outfits that fit you and your lifestyle. If you’re looking for a collection of tried-and-true recipes your family will actually eat, then look no further! Cooking with Mom includes one tasty, almost country, mostly-from-scratch recipe after another, all with easy-to-follow directions. Over 100 recipes included! The Cherished Home will help you make the most of your days. As life seems to get busier, we have to make plans to keep our lives simple and make the most of every day. Our families are our precious treasures and such a gift. Learn to take time to slow down and cherish this season of life. Tell Your Time outlines a straightforward, step-by-step approach to controlling your schedule and making sure the important things don’t fall through the cracks. It’s short and to the point because time management books shouldn’t be time consuming. Creating a Schedule That Works offers you the tools to help you create and implement a schedule that works for you and your life. The simple, straightforward approach shows you how to break your day into bite-size pieces by scheduling four blocks of time in your day to help you meet the demands of your day-to-day life. What if you could improve years of late habits in just 28 days? With help from this book, it is possible! Full of useful tips and funny confessions, 28 Days to Timeliness is packed with practical information that will help you learn how to manage your time so you can be on time. Stay on task and organized with this bright and beautiful open planner. The planner runs from January 2015 through December 2015. You’ll never lose track of birthdays, events, appointments, or anniversaries! Advanced Penny Pinching features over 70 pages of tips and tricks for maximizing your grocery budget and contains all of the information Tabitha personally utilized to shrink her family’s grocery expenses from over $600 a month to an average of $250 a month. Also, receive the Produce Best Price Guide and a printable Stockpile Worksheet Template. Homeschool 101 takes a look at different reasons families homeschool, and how you can know if the Lord has laid homeschooling upon your heart. The different methods of homeschooling are addressed, as well as materials you will need to get started. 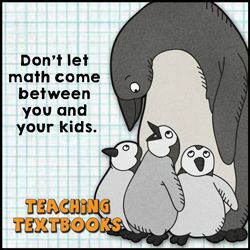 Homeschooling can be a daunting task—especially when you consider the realities of making it happen! Discover a powerful, freeing approach to organizing your homeschool day based not on schedules but by following your family’s learning rhythm. Do you struggle with keeping a gentle answer when responding to your children? This 21-day devotional offers you practical help. We are commanded to teach our children diligently. It takes hard work but our reward is an eternal one. 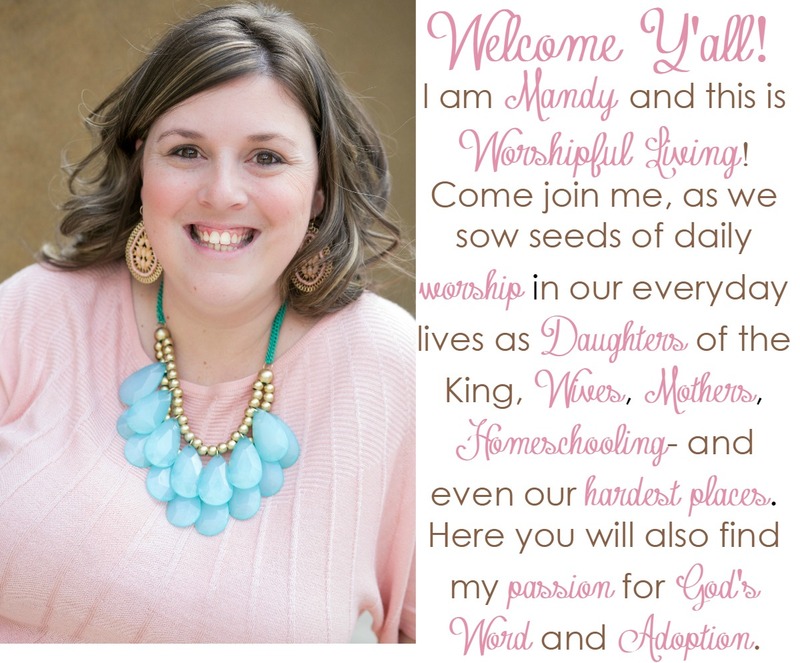 Join Mandy as she dives into how we can train our children diligently in several primary areas of their lives. This student planner contains the following pages: a personalized cover page, weekly planning pages, monthly calendars, and week-at-a-glance pages. These awesome planners will help your child develop a sense of responsibility and independence as he/she keeps track of his/her days and weeks. The Good Wife’s Guide encourages women to make faith and family their first priorities from a place of sacrificial love. It reminds women that they were created with a specific purpose in mind, which is that of being a helpmeet. In supporting our husbands and living in unity we reflect God’s blueprint for marriage. Spring is here, and we are all thinking about cleaning up our homes. But what about our lives? Let’s take a deeper look into the Bible as we seek to clean out our hearts and lives for this new season. It takes work to make a marriage thrive. 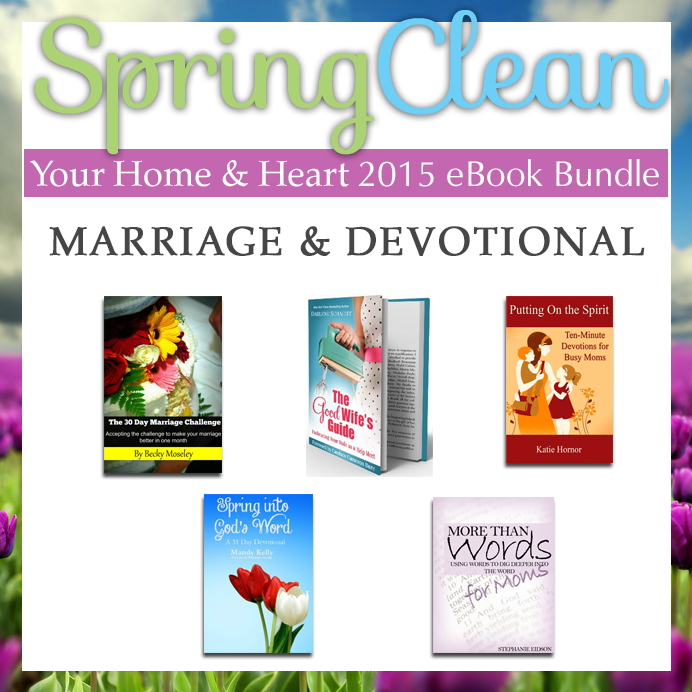 In this book, you will find a unique challenge each day that you can apply to your marriage. These challenges will radically transform your marriage into something better than you ever dreamed. This one-month daily devotional on the fruit of the Spirit will challenge you to examine yourself in light of the Scriptures and give you something to apply to your life each day. Foreword by Heidi St. John. 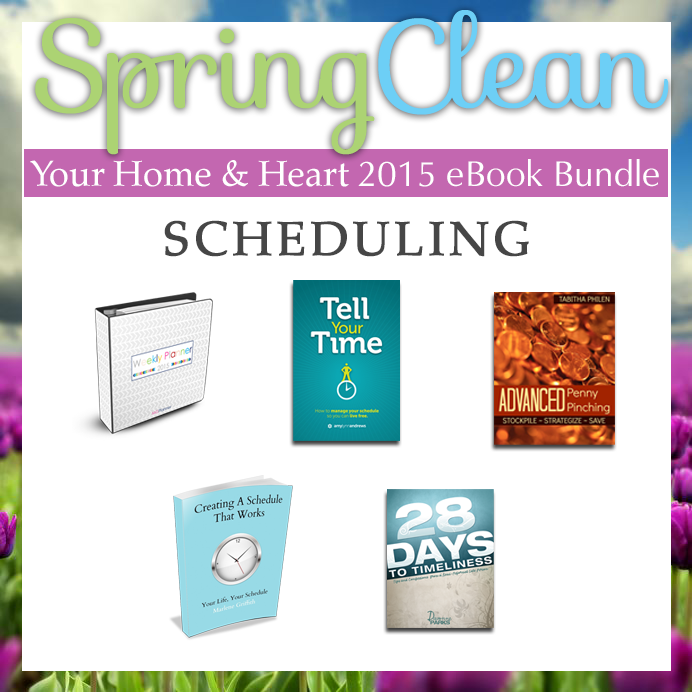 Comes with a free downloadable workbook. A 20-day devotional designed to fit into a busy schedule. This devotional is perfect for teens and adults alike. 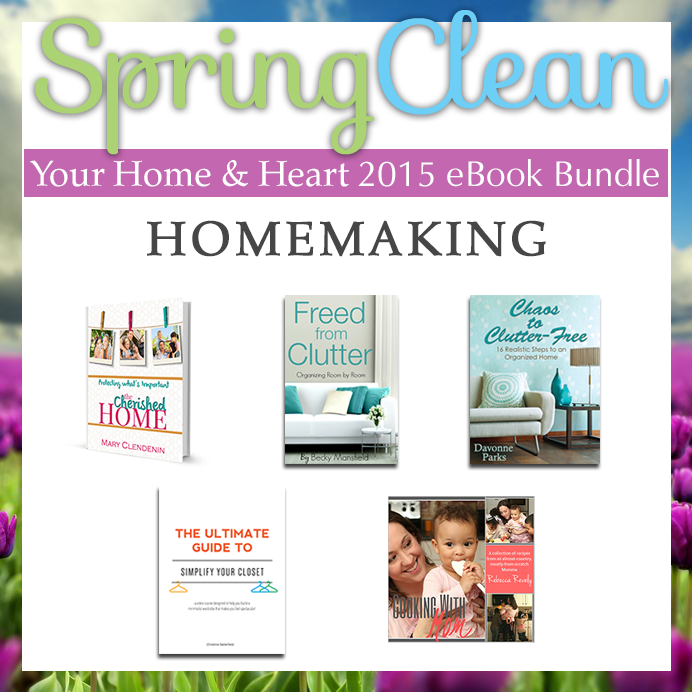 This Spring Clean Your Home & Heart eBundle will be available from March 2–7 for only $14.74. That’s a savings of $124, so hop on over and buy it now! 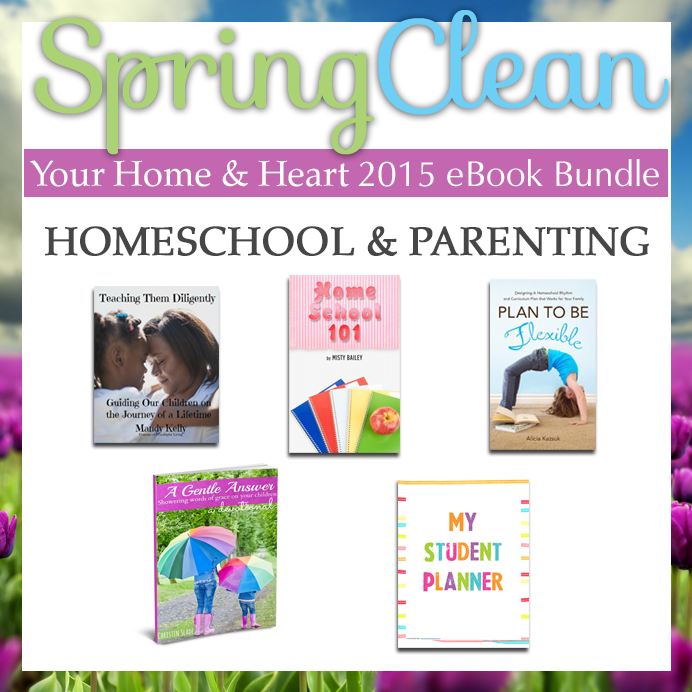 Yes, you may share resources you won’t use from this bundle with a friend! To do so, download and save the file, then email it to your friend and delete the file from your computer. Better yet, purchase two bundles so you can keep one for yourself and give the other away to various friends throughout the year! We trust our readers to be respectful of the bundle authors, so please remember to only use this privilege as you would a print book—once you give it away, you no longer have the book to read or to give away to someone else. Download and back up your eBundle right away! We can only renew download links until March 15, 2015. If you can’t find your bundle after your purchase, check the spam folder in your email account. Due to the downloadable nature of this eBundle, refunds are not available. If you have any questions about any of the resources included in this eBundle, please contact that author directly. If you have further questions about the eBundle, contact Davonne Parks, Organizer or Finding Joy in the Journey for assistance! It’s not too late to join the fun! Only available from March 2-7. Don’t miss out! 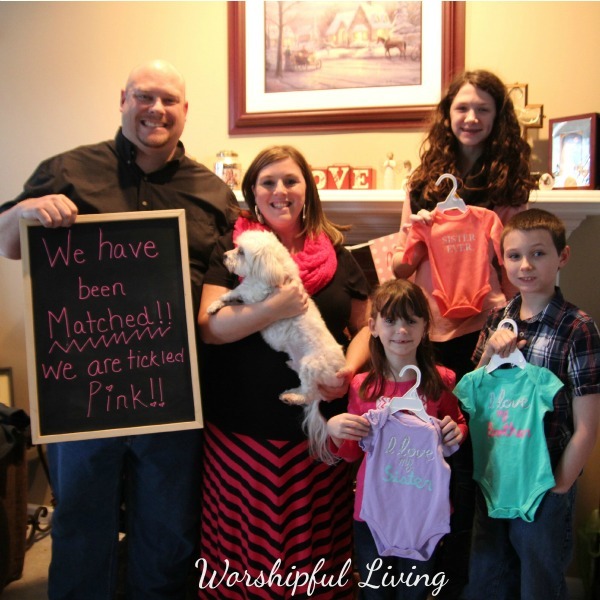 SO excited for you that you’ve been matched!!! I can’t wait to see photos of you with your little pink bundle! So happy for you and your family. I’ll be praying that everything will stay on track for you to welcome this sweet addition to your home.